Professor Burns Weston and I recently published a series of six essays on CSRWire (CSR = “Corporate Social Responsibility”) that were derived from our book Green Governance: Ecological Survival, Human Rights and the Law of the Commons, published by Cambridge University Press in January 2013. 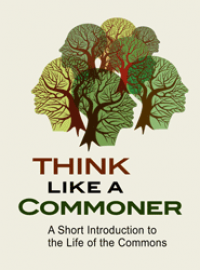 The book – an outgrowth of the Commons Law Project -- is a direct response to the mounting calls for a paradigm shift in the way humans relate to the natural environment. Green Governance opens the door to a new set of solutions by proposing new types of environmental protection based on broader notions of economics and human rights and on commons-based governance. At the heart of the book is a new architecture of environmental law and public policy that is theoretically innovative, but also quite practical. At least since Rachel Carson’s Silent Spring, we have known about humankind’s squandering of nonrenewable resources, its careless disregard of precious life species, and its overall contamination and degradation of delicate ecosystems. Simply put, the State and Market, in pursuit of commercial development and profit, have failed to internalize the environmental and social costs of their pursuits. They have neglected to take measures to preserve or reproduce the preconditions of capitalist production – a crisis now symbolized by the deterioration of the planet’s atmosphere. Despite the scope of the challenges facing us, there are credible pathways forward. In our recent book, Green Governance: Ecological Survival, Human Rights and the Law of the Commons, we propose a new template of effective and just environmental protection based on the new/old paradigm of the commons and an enlarged understanding of human rights. We call it “green governance.” It is based on a reconceptualization of the human right to a clean and healthy environment and the modern rediscovery of the age-old paradigm of the commons. 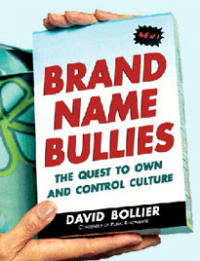 self-organized and enforced in complex and sometimes idiosyncratic ways (which distinguish it from communism, a top-down, State-directed mode of governance whose historical record has been unimpressive). Today the commons can be seen in such diverse resources as the Internet, rural forests, fisheries, town squares, universities and community life. 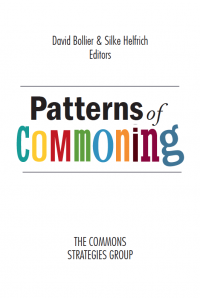 A commons is generally governed by what we call Vernacular Law – the “unofficial” norms, institutions and procedures that a peer community devises to manage its resources on its own, and typically democratically. State law and action may set the parameters within which Vernacular Law operates, but the State does not directly control how a given commons is organized and managed. 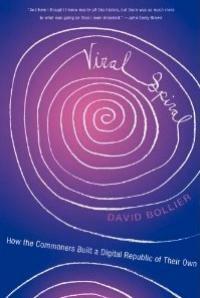 In its classic form, a commons operates in a quasi-sovereign way, similar to the Market but largely escaping the centralized mandates of the State and the logic of Market exchange. By mobilizing decentralized participation on the ground, commons could become important vehicles for assuring a right to environment at local, regional, national and global levels. Moving in this direction, however, will require innovative legal and policy norms, institutions and procedures to recognize and support commons as a matter of law. In this CSRwire series drawing upon our book Green Governance, we outline our vision for re-imagining governance and stewardship of natural resources. Our premise is that human societies will not succeed in overcoming our myriad eco-crises through better green technology or economic reforms alone. We must pioneer new types of governance that allow and encourage people to develop qualitatively different types of relationships with nature itself and, indeed, with each other. An economics and civic polity that valorizes growth and material development as the precondition for virtually everything else is ultimately a dead-end—literally. A logic of integrated global and local citizenship that insists on transparency and accountability in all activities that affect the integrity of the environment. A new Commons Sector, operating as a complement to the State and Market, could reinvent some of the fundamental ways that we orient ourselves to, and manage, natural ecosystems. It could give rise to new institutional forms, legal principles, socioecological management practices, economic thinking and cultural values. Our vision of green governance does not call us back to communism or socialism, nor rally us to utopian eco-anarchism. We believe that the pursuit of a clean and healthy environment through commons- and rights-based ecological governance is a feasible extension of existing models and trends — but one that will require some challenging transformations. At the moment, transformation is essentially blocked because any serious agenda for change must genuflect before a series of sacrosanct dogmas – that law is exclusively a function of the State; that markets and corporations are the primary engines of value creation and human progress; that governments generally impede innovation and efficiency; that the private accumulation of capital must not be constrained; and that ordinary people have few constructive roles to play in the political economy except as consumers and voters. These structural premises limit the scope of what is perceived as possible, and they are backed by powerful economic and political interests, Big Oil and Big Coal perhaps most prominent among them. But we see practical reasons for hope. Insurgent schools of thought in economics and human rights are expanding our sense of the possible. At the same time, a worldwide commons movement is arising in diverse arenas to assert new definitions of value and to challenge the contemporary neoliberal economic and political order. New modes of commons-based governance are being used to manage agricultural seeds, groundwater, urban spaces, creative works, Internet-based knowledge and a wide variety of natural ecosystem resources. If one attends to many commons-based trends now on the periphery of the mainstream political economy, one can begin to glimpse a coherent and compelling new paradigm — one that addresses many serious deficiencies of centralized governments (corruption, lack of transparency, rigidity, a marginalized citizenry) and concentrated markets (externalized costs, fraud, relentless economic growth). We consider countless commons-based regimes, both new and ancient, to be building blocks for a new paradigm of principled and effective ecological governance. 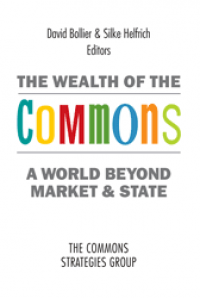 Can Commons Be the Basis for System-wide Change? systems — can be the basis for a larger, macro-solution. We believe they can so long as we develop a new legal and policy architecture that recognizes and supports the nesting of authority and control at different levels of governance (often known as “subsidiarity”). But we could as plausibly turn the question around: can any top-down, macro-solution succeed without genuine engagement with decentralized, participatory, self-organized systems? We think not. There is too much resentment around the world against State authority experienced as illegitimate, and the simple incompetence of State institutions in dealing with decentralized complexity. In subsequent essays, we hope to explain in greater detail how the general framework and discourse of Green Governance could open some compelling pathways – economically, politically and culturally – for societal transformation. 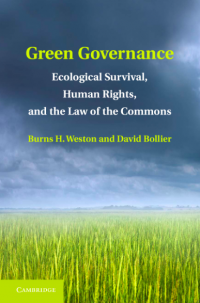 This essay is adapted from Green Governance: Ecological Survival, Human Rights, and the Law of the Commons, by Burns H. Weston and David Bollier, Copyright © 2013 Burns H. Weston and David Bollier. Reprinted with the permission of Cambridge University Press.